The New England towns of Amherst and Northampton are the heart and soul of the Pioneer Valley, which borders the Connecticut River just east of the Berkshire Hills. 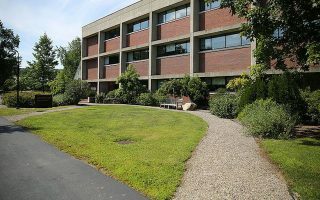 Also referred to as the “Five College” area, this zone is home to the University of Massachusetts, Amherst College, Hampshire College, Smith College, and Mount Holyoke College. 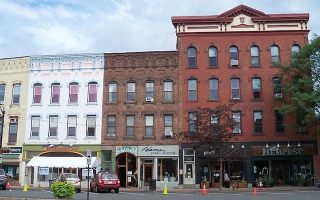 The influence of the colleges has promoted an artistic and socially progressive atmosphere throughout the Pioneer Valley, and while the eclectic downtown centers thrive with diverse eateries and arts venues, the surrounding area has remained true to its agricultural roots. Running in Amherst and Northampton is a great mix of historic towns, paths through bucolic college campuses, quiet country roads passing through by farms, and some popular multi-use paths. 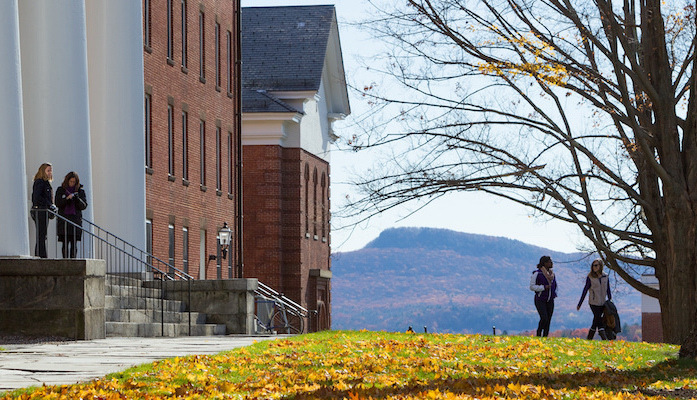 These eco-friendly towns are well connected with bike paths, sidewalks, and quiet back roads through rolling farmland offer scenic vistas of the Mount Holyoke range looming above the river. 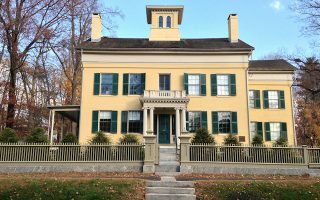 In addition to running tours of the UMass, Amherst, Hampshire, Smith, and Mount Holyoke campuses, we’ve mapped some excellent loops through the lively downtown centers, and a tour of Northampton’s colorful and quirky historic homes. 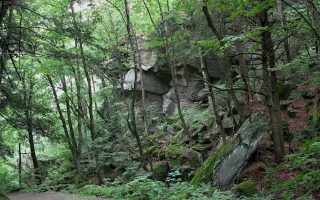 There’s also miles of excellent, accessible trail running throughout the area, especially in the Mount Tom/Holyoke Range, Arcadia Wildlife Sanctuary, Amherst College Wildlife Sanctuary, and Amethyst Brook along the Robert Frost Trail. Thanks to the Five College network, Amherst and Northampton are well connected by the Pioneer Valley Transit Authority (PVTA) bus system. Frequent shuttles link the two towns and run along main routes servicing the schools, residences, and shopping areas. Otherwise, a car is needed. Runners should also note that winters are cold and snowy, which might affect the runnability of some of the area’s paths and trails. The main bike paths in the area are plowed in winter! A running tour of the brick-faced downtown strip of North Pleasant Street, plus the hilly campus of Amherst College and Victorian residences such as the Emily Dickinson house. 3 and 4 mile options. Run the streets of fun and funky NoHo and the Smith College campus with 5 or 7 mile options, plus a 4.6 mile residential tour of the city’s most colorful neighborhoods. 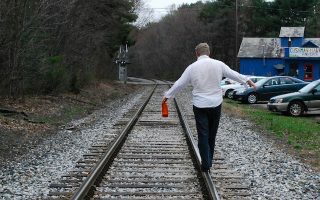 Three interconnected paved rail trails make up a scenic multi-use network stretching across Amherst, Hadley, Northampton, and Easthampton. 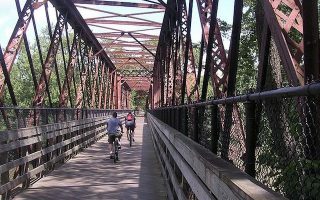 Our favorite sections include the east end of the Norwottuck Rail Trail and the scenic bridge across the Connecticut River. 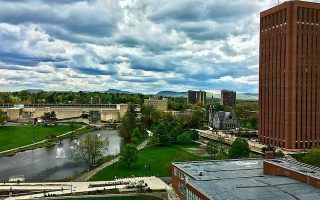 The sprawling campus of the University of Massachusetts, with its varied historic and modern architecture, has several scenic running options. We’ve mapped 3.1, 4.6, and 5.6 mile options. 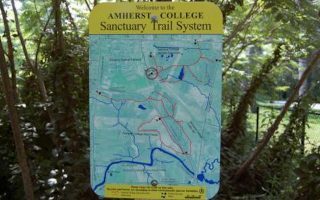 This secret forest behind Amherst College has nice, flat cross-country trails. Create your own route using the helpful trail map! Can also be combined with a Downtown Amherst or Norwottuck Rail Trail run. This quiet 6 mile route to Cushman Corner covers mostly residential streets, with nice farmland and mountain views from a series of rolling hills. This 4.5 mile loop incorporates some of Amherst’s best offerings: the downtown commercial strip, a slice of the UMass campus, and rural roads through scenic rolling farmland. 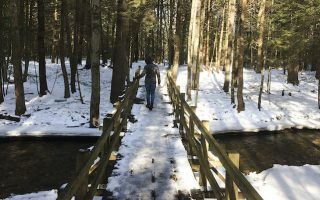 Popular flat and easy going trails along the Amethyst Brook and surrounding farmland can be combined with a section of the 47 mile long Robert Frost Trail for a scenic trail run. This ~5km tour of the wooded grounds of Hampshire College has great views of the nearby Holyoke Range. Includes both paved roads/sidewalks and dirt paths through campus. 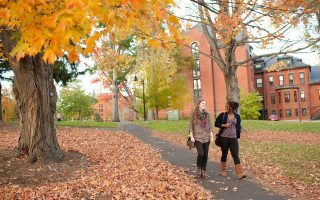 A short but scenic tour of the Mount Holyoke College campus in South Hadley is a treat for lovers of architecture. Our short campus route is mapped at 2.4 miles with another 2.4 mile add-on. 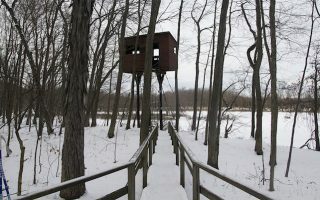 Flat, mostly non-technical trails through this scenic Mass Audubon property in the floodplain of the Connecticut River in Easthampton. 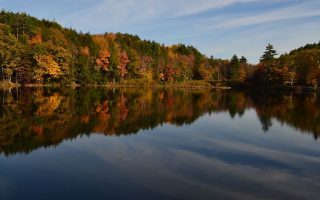 Run a 4 mile loop on discontinued dirt roads in this scenic land trust in Leverett, just north of Amherst. A nice mostly sidewalk run to the shores of Puffers Pond where runners can cool off with a dip before completing the loop. Lots of trail running add ons or road replacements. Start from UMass or a longer run from downtown. 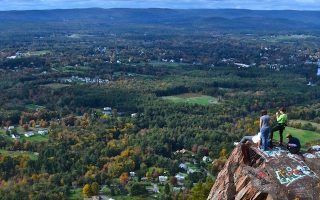 Adventurous spirits can test out their trail running chops in the mountains of the Mount Tom and Holyoke ranges. We’ve mapped a moderate 3.8 mile trail run to Rattlensnake Knob and included other maps for DIY options. This area has warm summers and cold winters. 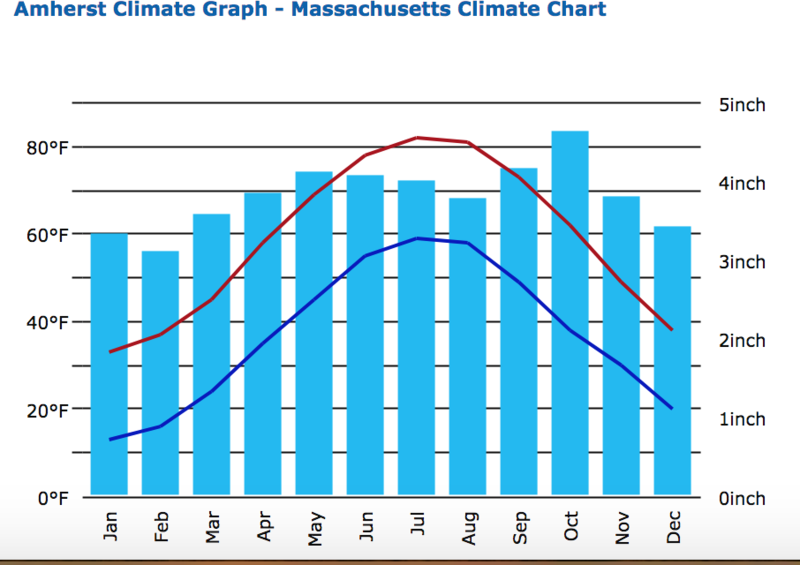 In summer, average high temperatures are in the low 80s (27C), with nights that can cool off. Winters are cold – high temperatures are around the freezing mark, but lows dip into the low teens (-10C). It snows, but not that abundantly. Fall is gorgeous for running, with crisp temperatures and great colors. 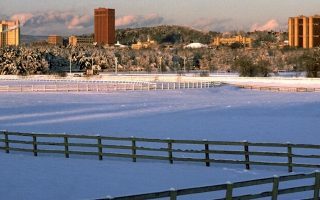 There are a few hotels in downtown Amherst, including the Hotel UMass, the Lord Jeffery Inn, the University Lodge, the Allen House/Amherst Inn, and the Black Walnut Inn. In downtown Northampton, visitors will find the lovely historic Hotel Northampton, the Autumn Inn, and a Fairfield Inn. There are also several economy and name-brand hotels along the commercial strip of Route 9 in Hadley, which connects Amherst to Northampton. It’s worthwhile to do a search for countryside inns and B&Bs, which are common throughout the area. As for running groups, check out the Amity Hill Running Club (which exclusively runs the Amity Street Hill), Sugarloaf Mountain Athletic Club, and the Marathon Sports Run Group which takes off Thursdays at 6:30 pm. For students, each campus also hosts running groups. The Happy Valley Half Marathon and 5k, the Amherst Half Marathon and 5k, and the Hot Chocolate Run are perhaps the areas most popular races, but you can find a full list of upcoming races here. For a challenge, sign onto the tough but scenic Seven Sisters Trail Race.